As a mold maker and developer, we know from experience that the decisive factor for production efficiency is how many high-quality closures can be produced within a certain time period. The closures must be easy to apply and use. At corvaglia, robust, tried-and-tested mold concepts go hand in hand with quality and precision. This means maximizing the number of closures produced in order to minimize both planned and unplanned downtime. As a mold maker, we make sure that every component fits every other component. This modular approach to injection molding comes with significant advantages for you as the customer: you remain flexible. When you want to modify the mold, you only need to replace certain parts. The result is one hundred per cent exchangeability and less time and effort spent on servicing and repairs for the customer. Our highly trained staff and state-of-the-art machine park allow us to keep within extremely tight tolerances. Our innovative cooling technology helps raise your efficiency. Rapid and reliable production processes will keep you calm, cool and relaxed – even if a hot summer is on the way. corvaglia modular injection molds: perfect closure production, hand-crafted precision, skilled specialists, state-of-the-art machinery, and top quality raw materials account for half of the success of our modular injection molds. The other half is our clear focus on caps and closures. Do you want to lead the way in cutting the cost of closure manufacture? Then you’ve come to the right place! We supply with exactly the right modular injection mold and we deploy our broad technical expertise to create the conditions for your sustainable competitive advantage. Gladly, we will advise you on the selection of the appropriate modular injection mold or help you to turn your product ideas into reality. 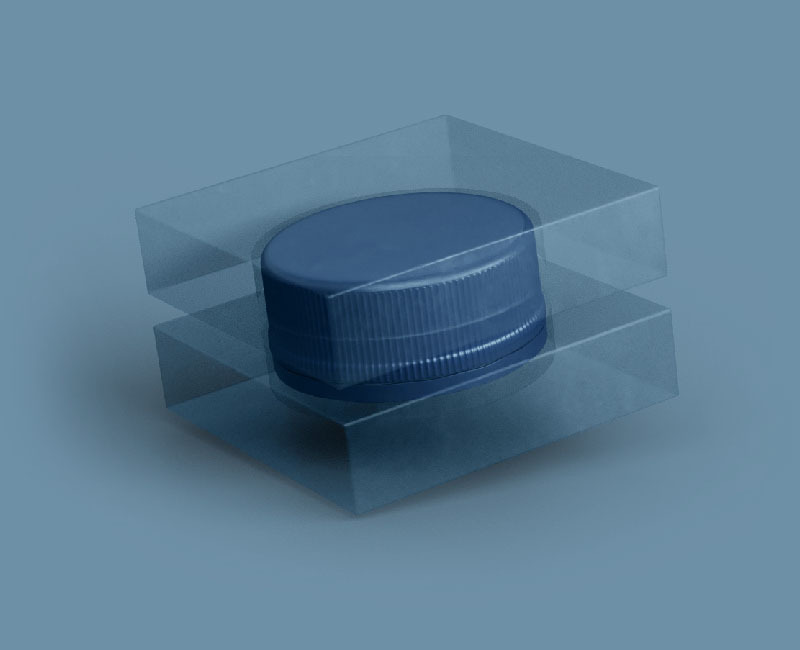 We are ideally positioned to do so because our expertise ranges from cap design to the fabrication of the modular injection mold and cap production right through to fitting the cap onto the bottle. Our modular mold systems combined with the high precision allows you to extend your capacity easily. We guarantee that any new or re-worked mold within our family of standards is compatible with those that you have purchased from us in the past. Another benefit of the modular mold system is that you can amend the design of your molds by re-working some parts only. This gives you flexibility at reasonable cost. We are proud of our tool making technology. For example, our latest technological developments allow us to bring the cooling water closer than ever before to the hot plastic material. Our cycle times are one step ahead of the competition. Specially selected materials and innovative surface finish technology enable us to regularly stretch the boundaries of what is feasible just that bit further. All of our molds are sampled under normal production conditions before delivery to the customer. High speed milling, spark-erosion equipment, and CNC grinders. Only by using state-of-the-art machines and equipment with a high level of automation, it is possible to efficiently produce precision mold components and molds for cap manufacture. Significant investments ensure that our workshop equipment is always above standard. We are inspired to be flexible and fast by continuously developing new caps, as well as by steadily refining existing caps. Our design specialists and skilled toolmakers work in a bright and stimulating environment. A continuous programme of ongoing training for our staff means that each manufacturing cell is used to maximum efficiency. We also run a special training department for our apprentices. corvaglia has a state-of-the-art warehouse with dynamic minimum-stock monitoring to guarantee quick, efficient delivery of spare parts. Spare parts and wearing parts are also available for tools that are more than 20 years old. Competent advice guarantees fast, reliable service worldwide. You can order spare parts and a wide range of accessories around the clock. Please use the contact form.